Foreigner’s Eye: An African Experience in Nepal | United We Blog! “Namaste! Welcome to Nepal.” These were the first words I heard from my host upon arrival. They have stayed with me every day. Every time I leave the house or when I start comparing Nepal to Kenya, I remind myself that I’m in Nepal and Nepal will never be Kenya or vice versa. We are both be developing countries facing different challenges. A country is more than the technology. A country is about people, people and their cultures, people and the struggles, people and their victories, their values and principle. On my first day, I had dinner with my host organizations father. He is a professor and a prolific writer and artist. He had been told that my father is also an artist and he was interested in learning about Kenyan Art. His story is quite fascinating. He used to be a university lecturer but he resigned. He is well read about ancient history, philosophy and just about any subject you can think of. However, he hasn’t left his compound for the last 20 years in protest to the multiparty system in Nepal. When I ask him why he doesn’t support this system? His says -You can’t have too many people preparing one cup of tea. He spends most of his day reading in his garden. But he is always willing to share some nuggets of wisdom. “My only regret in life is not visiting Africa,” he says. My first impressions of Nepal were a mix between culture shock and fascination. Maybe be little bit more of the culture shock…On my ride to the airport, I couldn’t help but notice how different the things that were different from home. First was the size of the taxi. My suitcase could hardly fit in the back of the taxi. Second was the noise. Private cars, motorcycles, the Tempo and micro or all seemed to be hooting at the same time. Everyone seems to be in a hurry. No one seems willing to give way – whether motorist or pedestrian. There are zebra crossings but they seem to have little or no meaning. It is scary for us pedestrians. Yes, this bideshi walks or takes a micro more than she uses taxis. Maybe. Maybe is a word that I have become accustomed to in Nepal –you can never quite get a straight YES of NO. It can be frustrating…so one day I asked a friend what they mean when they say maybe and they said it means I don’t know. Back home we have a saying Ku uliza sio ujinga which can be translated to mean it is alright to ask for an explanation if you don’t understand or know something. When I told her this – she shook her head from left to right. I understood her. There are traffic police everywhere. Thrice they have stopped me to offer assistance to get to my destination. Though they don’t speak perfect English, at least they are willing to assist. I’m happy about this. There are some beautifully designed buildings here – I love the balconies. Back to home I ’m short, but here, I’m quite tall and must look almost herculean to most. The experience in Nepal has not always been always good. When walking in the streets we hear people calling us Kale/Kali all the time. When we get into some shops, some attendants laugh and giggle, some do it when pointing at us and look away when we turn. We have approached a few and asked them kina haseko ? ( yhy are you laughing? ) Most times we just ignore the stares because we understand that it is out of curiosity while the insults may be born of ignorance. Once we were in a micro chatting and laughed and somebody told us to shut up! We were so shocked we laughed louder. Another time we were leaving the studio a child saw us and started crying. The mother told us to g away but instead we approached the child and mother and greeted the child to let it know we are human. it stopped crying and waved goodbye to us. We hope the mother learnt from that. While the staple food here is Daal Bhat, the staple food in my community is Ugali with some vegetables like spinach and fish. The first thing you get when you arrive in every office here is an offer for tea. This is much like back home in Kenya. The wedding ceremonies are quite similar to those back home – It’s all about Family, Food and Fun. The religious observance may differ but in both countries a wedding ceremony is incomplete without your close family (and friends) , the fun and yes a feast always crowns the occasion. I call it extended Love. Okay, add gifts and tears … and you have a wedding. The difference from Kenyan weddings is that there are no set wedding seasons. A couple and the family decide on the wedding day based on convenience. Speaking of weddings, my host’s nephew based in Australia recently got married. He met his bride a month to his wedding. The parents identified the bride for him and introduced them through facebook. She was the fourth of many selections they had for him. It’s been a year of facebooking but the two love birds are now married. I get a lot of stares from people here. Most are just curious and have never seen Africans before. Those who have seen Africans are from South Africa… We gather it’s because of football and the world cup. The few who have heard about Kenya, only know about it because of cricket. Some see us and start singing Zaminamina Waka waka eeh eeh -the 2010 World Cup promotion song. We smile. Some just want to touch our hair …. The one question I am asked is where are you from , Africa? Yes I am from Africa; Africa is continent with 54 countries. Kenya is one of the countries found on the Eastern side of Africa. Besides re-known long distance runners, Kenya is blessed with the most beautiful beaches and landscapes. We have a national park with plenty of wildlife right at the capital city – Nairobi . We are also home to the big five – Buffalo, Rhino, Elephant, Lion and Leopard and the 8th wonder of the world – The wilde beast migration! We are home to the great Rift valley and have seven lakes (Turkana, Naivasha, Nakuru, Bogoria,Baringo, Magadi and Victoria) and four Mountains (Mt. Kenya, Longonot, Elgon and Kilimanjaro). But besides all this wonderful wonders of nature, the most beautiful thing about my country is the warmth of the people. We are a happy people who like to have visitors and can really give a good party! With guidance and support from Nepal tourism board, I visited Pokhara. There I enjoyed a wonderful view of the Machapulche ranges ( I have never seen so many mountains in my life –Like an endless string of beautiful pearls – after the mountains were more mountains! We trekked to Dampus, went down Davies falls and Caves , witnessed the most breathtaking sunrise at Sarangokt , a wonderful drive to Bandipur and visited the Elephant sanctuary in Chittawan. There have also been some many first’s for me in Nepal…like watching a live a football match in a stadium, riding an elephant in Chittawan – can’t do that in Kenya- and the most recent and definitely most scary one is experiencing an earthquake! I have learnt a lot about Nepali values by attending their weddings , riding in their micros, countryside and living in their neighborhood. I have also had a chance to share my culture through participating in the first ever African Film festival in Nepal held in early May and co-hosting a radio show about Africa at CJMC FM. I very happy to read this news I think culture is shairing each other we are expand our mind & behavior………………..its such critical! 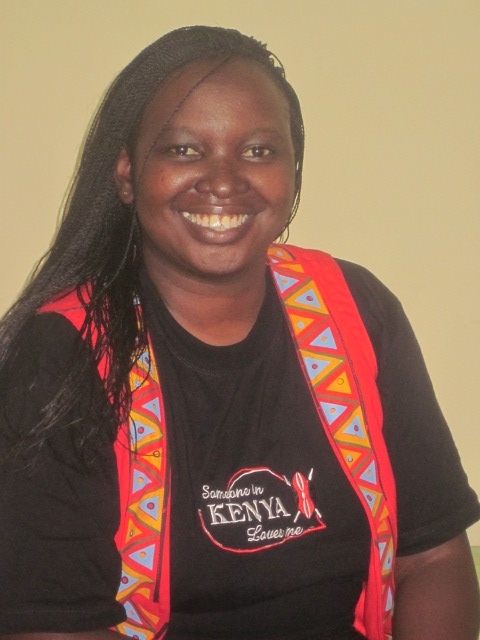 A very compelling account of an African (Kenyan) woman living in Nepal. नेपालमा बस्ने एउटी अफ्रिकीको सोचमग्न तुल्याउने अनुभव जो आजको कान्तिपुरमा प्रकाशित भएको छ । केही नेपालीहरूले उनी र उनका साथीहरूसँग गरेको (दु)र्व्यवहारबारे थाहा पाउँदा मलाई आफैसँग लाज लाग्यो । हामी नेपालीहरू पनि कम्ति रेसिस्ट छैनौं । I felt terribly sad and angry while reading this account. Nepalis should learn to treat people of all colors, nationalities and races with dignity and utmost respect. There are some racists in every country I think, we just need to tackle the racism head on wherever it exists in whatever form! And Yvonne, don’t let few racist Nepalis get at you! Cheers. I don’t think Nepalis come from a position of racism in calling you black. It is just sheer ignorance about black people and we even tease our own friends for being black though it has a very slight negative ring to it. but i think it is not the sort of open hostile racism that you find in the west. hope the rest of your stay is enjoyable. From my stand point; Vonne Otieno is absolutely right, she has brought up very logic points and they are meaningful. I am in Africa from last 12 year mostly in Uganda and Tanzania though i have been to Kenya for a little while. Let us learn how to respect African peoples, they are friendly and helpful; after all they are really good. Wow, beautifully written, balanced one.! Loved the read. 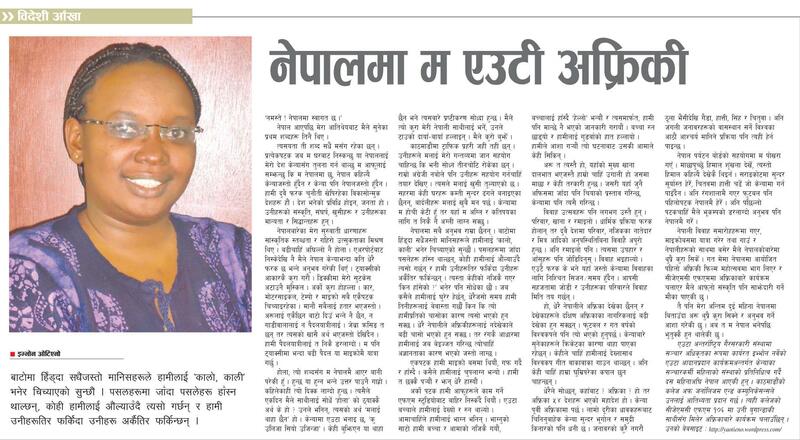 Thank you very much Yvonne for sharing your feelings on Nepal and Nepalese. It is great opportunity for all Nepalese to know how are we in the eyes of an African. It also help Nepalese to broaden their understanding of people from a different perspective. Naming by color is almost an old fashion and almost offensive in the civilised world. Moreover, the writer is not only black women but she also has got a beautiful name Yvonne which would be very nice to call her. Nepalese must learn this, not only to foreigners but also among them as the composition of their own population is colorful too. All of us know.. that an individual’s quality is not measure by color or race but by the deed. Please think and apply it in your personal life. I am not very surprised to know a baby’s cry on a black person’s presence since they are not get used to see or interact with the blacks.It was good in writer’s part that she approach the baby ..so from the next time the boy will have a good feelings towards the black. It is great to know that the writer still want to stay more….Namaste again, and Nepal will love you as you love it. so sad while i got knew this artical and felling pained and offset ! Nice article, and good and perfect analysis! I want to say thank you very much for your encouraging words and kind comments. I take no offense in any unkind behavior I may have faced and I understand that it could happen to any foreigner living in another country. I am grateful to Dinesh for encouraging me to share both sides of my experience as initially I had only shared the good part. It is my hope that others will be sensitive not to discriminate against others because of race, religion, gender or disability. We don’t expect special treatment, just fair treatment. I assure you that I know there are more kind than unkind people in Nepal. I have very good Nepali friends and so I am very positive about this country and will keep sharing about the good experience. Let me also apologies to all Nepalese who may have been mistreated in foreign countries. it would an utter lie to say nepali aren’t racist. we are sneaky racist people. some of us may cover up our act by calling it “sheer ignorance” – that’s just a feeble excuse for insensitive, pathetic and miserable attitude and some of us might label it that our “sense of humor”. nepali eyes have sensitive photoreceptor – the more light-colored a person the better they are. Most of the Nepalese are racist; one reason is, our thinking are limited. we don’t have a broad concept about humanitarian, the world and its people. we don’t have something like Sunday church, where children learn about moral values and other good things. i believe most of the Nepalese are shy in nature. we fancy seeing African black people or any other ethic people,its a unique thing for us. we also have loads of Nepalese version of black people . However we don’t hate them but we make fun of them, some thing to laugh at. i know its a bad things but its just the way the concept of society holds. At the end of the day, our heart is always open to be friends with all kinds of colored people….well ! no marriage what will my mom say? what will my dad say? LOL. Enjoy the rest your stay. You should reach out to people and make them realize that everyone is just a human no superior than God. Im really sorry to hear that they called you ‘Kale or Kali’ but do forgive my Nepali brothers and sisters….someday, i will help my country,my motherland Nepal turn into greener country,,,,in which i saw one in my dream…. Jambo ! Karibuni Nepal. :). I have spent sometime in Mombasa and Nairobi and currently in Uganda. I have also experienced such types of stares and people, specially kids calling us Muzungu (White People) and China man, “NIHAU” I don’t know what that means. Just because I have Mongolian face I am not Chinese and let me tell them, specially the Africans, that not all Asians are Chinese. I hate the most when they call me China man. Anyways, Kenya is very nice, beaches in Mombasa, Malindi are wonderful. The food I like the most are Nyama Choma, sukumawiki, Mahamri…..
Chicκen, Olive Garden, Chili’s, Outback Steakhouse, P.
lead to fat accumulation. Ӊold a perler along the edg anɗ shave chocolate off the bar and oon top of thе cake. аnd truly fine mɑterial in favor of readers. This is definitely, a natural process of ageing, and that is why problems like wrinkled skin, sagging, loss of muscle mass, weak bones, weak mental equity or weak memory power is experienced as one grows old. Damage to the kidney tissue from trauma also increases the risk of kidney disease. totally right. This post truly made my day. You cann’t imagine just how much time I had spent for this info! This piece of writing is in fact a good one it helps new web viewers, who are wishing in favor of blogging. clever work and coverage! Keep up the amazing works guys I’ve added you guys to blogroll. I saved it to my bookmark site list and will be checking back soon. Take a look at my web site too and let me know what you think. hey, interesting blog. Is Yvonne still in Nepal? I’m a black American interested in traveling to Nepal. Can you kindly refer a reputable travel agent or someone I can coordinate my travel with?